A Venezuelan mother take time to breastfeed her child. She has been selling candy (left) in the streets to try to earn money for food and other basic necessities..
Benediction Box / Caja de bendiciones is born from the Little Free Library and Little Free Pantry, two grassroots efforts to improve a community. There are homeless people in every country as well as large numbers of refugees in some countries. They beg in the streets of the cities for work and money to buy food, utensils and personal care items – things many of us take for granted. The vast majority are good, decent people caught up in bad situations that are not of their own making. Some homeless people and refugees use the money to buy alcohol and drugs, so there are people that won’t give them anything. People are also afraid to give money to the homeless people and refugees in the streets because of prejudice or because they support relief agencies and feel they have done their part. And many people simply become numb when there are hundred or thousands of homeless people begging in the streets. 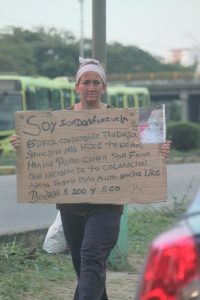 A Venezuelan mother begs in the streets for money to buy food. 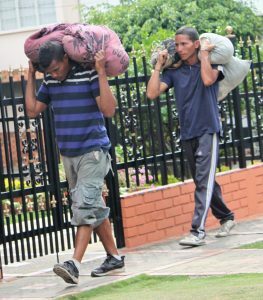 These refugees may have had jobs or businesses in Venezuela, but because they lack valid passports and the resources to obtain legal status in countries like Colombia, they are unable to obtain gainful Instead they beg in the streets, are cheap laborers or prostitutes. In many countries homeless people and refugees who have obtained money face additional challenges. When they go to a store to buy food or personal care items they usually are limited to buying from the smaller merchants that have the highest prices, so the money does not go very far. There are also many countries where every purchase from a brick and mortar merchant requires the buyer provide a current and valid national ID, something many homeless people and refugees lack. The merchant must record the ID number for each transaction, so even if they can get to a larger merchant with better prices, they cannot obtain what they need. There are also some small merchants that take advantage of this situation. They will sell to homeless people and refugees without a valid ID, but they charge extra or demand favors; especially from women. Government and NGO relief programs are doing their part, but are often overwhelmed by the shear numbers of homeless people and refugees. There are often long lines of people in need seeking aid with no guarantee of success if one makes it to the front of the line. And in many instances, the homeless people and refugees find they must provide information and documentation they do not have with them at the time, or cannot obtain, so they leave empty handed. Venezuelan refugees carry virtually everything they own as they seek a place in this city of over 500,000. Almost everywhere you go there are Venezuelan refugees and the social services are overwhelmed. The Benediction Box is a way to get homeless people and refugees the basic food, utensils and personal care items they need. People can donate money or food, utensils and personal care items to Benediction Box, and our volunteers will distribute everything directly to homeless people and refugees in the streets. No waiting in lines. No information or documentation. Just the food, utensils and personal care items the homeless people need now, with a small stipend for fresh foods or whatever. Benediction Box is a 501(c)3 tax exempt non-profit. You may donate funds directly online, which is the least expensive and most efficient way for us to get funds to our volunteers. Our first efforts will be in Colombia where there are millions of Venezuelan refugees and where we have a small core of volunteers already distributing Benediction Boxes. We know we will only make a tine dent in a huge problem, but what we can do we will do. We also know every homeless person and refugee we give Benediction Boxes to will make a difference in their individual lives. 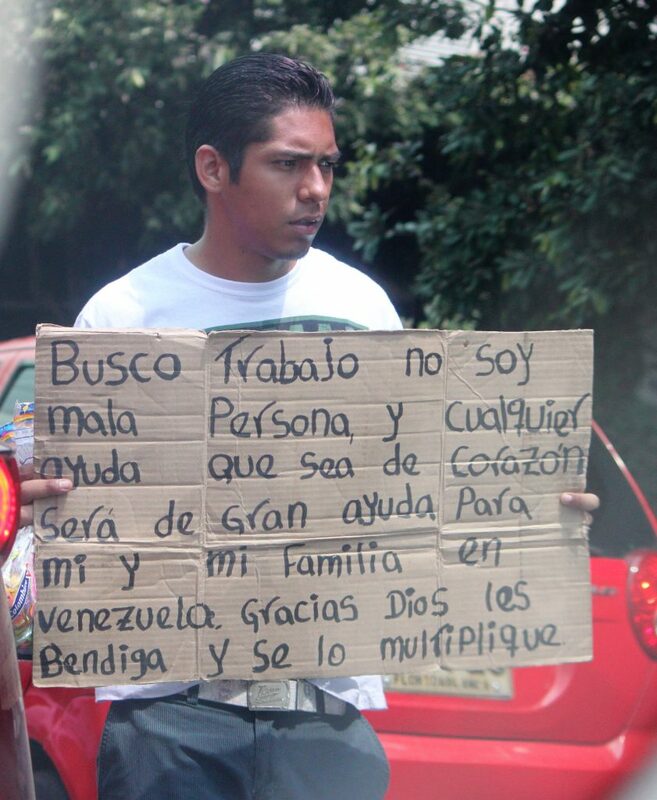 A young Venezuelan father begs for work in the streets to support his family. No matter what his education, training or experiences, if he does not have the identity papers that allow him legal status in Colombia, he can’t get a “real” job. A young Venezuelan refugee mother carries her son while she begs in the streets for money to buy food. She is pregnant and he is covered with a towel to protect him from the tropical sun with his prized Superman toy. She will be out begging virtually every daylight hour every day of the week. Local social services are overwhelmed with the number of refugees. Flyer about Benediction Box Intl.